The UBS thermometer reads 29-degrees at the corner of Broad Street and M.L. King Blvd. 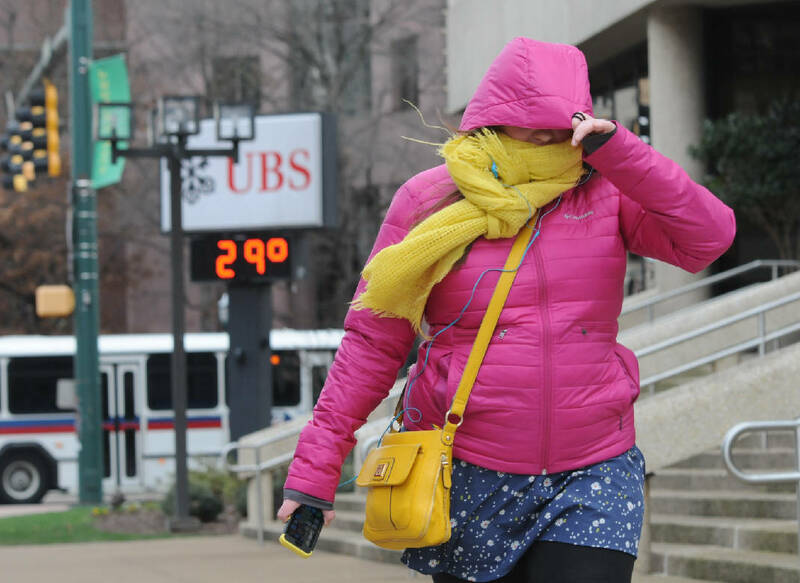 as Catherine Morrison walks into a cold northwest wind in this Jan. 7, 2015, file photo. Where: 1512 S. Holtzclaw Ave.
To donate to the Salvation Army of Greater Chattanooga, call 423-756-1023 or go to csarmy.org. A short spell of very agreeable spring weather is about to be interrupted. A freeze watch is in effect for Southeast Tennessee starting late tonight into tomorrow morning, with temperatures expected to dip down around freezing tonight and tomorrow night. The National Weather Service said a cold front that was expected to move into the region Thursday night is the culprit. "The cold front that brought showers and some thunderstorms Thursday has cold air behind it, causing temperatures to dip across the southern Appalachian region Friday, Saturday and Sunday," NWS meteorologist Derek Eisentrout said as the sky began to darken Thursday afternoon. The Salvation Army sent out a release Thursday saying it would open its overnight warming shelter for the homeless on Friday and Saturday nights. The Chattanooga Community Kitchen closed its overnight shelter for the season March 15. Kimberly George, director of marketing and development for the Salvation Army of Greater Chattanooga, said the only other overnight shelter open in town is the Chattanooga Rescue Mission, and that they would likely hit capacity this weekend. "We made a promise to the other homeless services providers in the city that if temperatures got this low, the Salvation Army would be open," she said. The Salvation Army doesn't budget for the overnight shelter, so donations and/or volunteers would be welcome, she added. Temperatures are expected to rebound by the beginning of the work week, Eisentrout said, with temperatures back into the 70s by Wednesday. Contact Will Healey at whealey@timesfreepress.com or 423-757-6731.